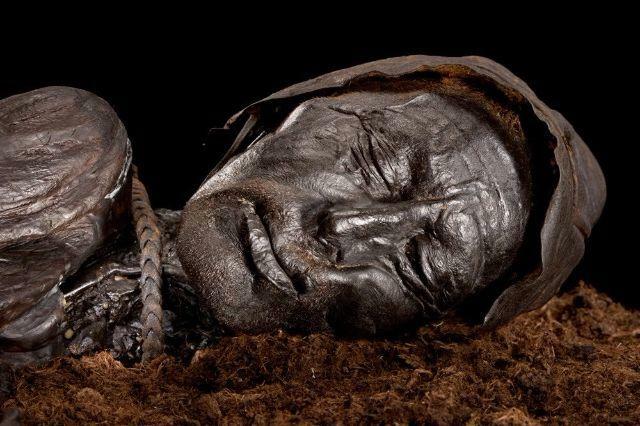 Would you believe this peaceful, careworn face is that of a 2,000-year-old bog body? Discovered by accident in 1950 in the bogs of the Danish Jutland Peninsula by some peat farmers. The farmers believed they had found a murder victim, so they notified the police. 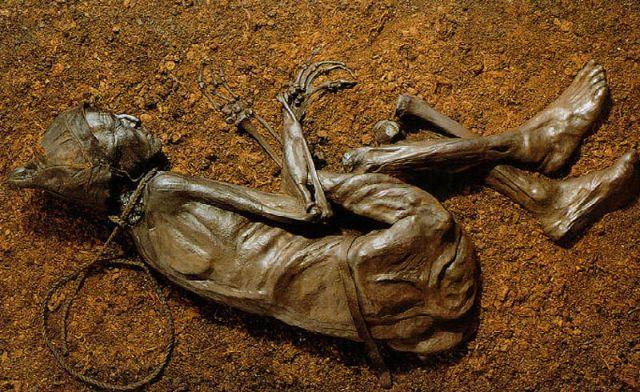 The body had been discovered 2 1/2 meters into the peat, but there were no signs of recent digging so the police were almost certain that it was more a case for the people at Museum Silkeborg than the police. Nearly 60 years of examination have revealed that this was a hanging victim possibly as a sacrifice. Rope marks were discovered around his neck and his tongue was swollen-common with hanging victims. An autopsy of the man's stomach revealed a last meal of veggies and a variety of seeds, some wild, some not. Unfortunately preservation techniques in the 1950s were limited and ultimately only the Tollund Man's head, feet and right thumb were permanently preserved.